New production model gets only few tweaks from concept. 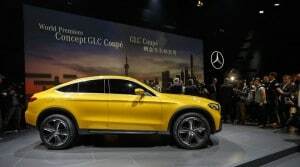 Mercedes officials confirmed in Shanghai that the GLC Coupe Concept will go into production. Right after the Mercedes GLC Coupe Concept made its world debut at Auto Shanghai, officials revealed it would hit the streets. Thomas Weber, Daimler AG’s board member responsible for Research and Mercedes-Benz Cars development, confirmed that the dynamically styled SUV will go into production. 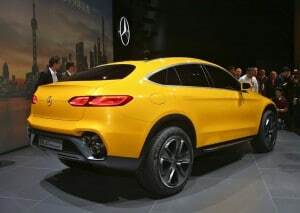 The concept car is a “near-production-standard” study that transfers the styling of the GLE Coupe into the midsize segment and shows the design of upcoming SUV generations. The new GLC will hit showrooms, but Mercedes officials would not reveal when. The GLC Coupe concept shows a sporty styling that is enhanced by large 21-inch wheels. As usually the case with a concept vehicle, the designers have some freedom and used small mirrors with round turn signal lamps, and placed the diagonal double exhaust pipes above the rear bumper. The GLC is based on the C-Class and uses the MRA-architecture, but the suspension in the rear is different, because there will also be a hybrid model with the battery above the rear axle. “With 4Matic all-wheel drive, the car has good off-road qualities,” according to Ketz. During the presentation, CEO Dieter Zetsche said that the GLC Coupe is “born to race on every ground” and will offer sporty on-road capabilities. The suspension is suitable for a truly dynamic handling style and drivers will get a choice of five driving modes. Under the hood of the concept car is the V6 bi-turbo engine, which we know of the GLA 45 AMC. It has 270 kW/367 hp and 520 Nm of torque and works together with a 9G-Tronic automatic transmission. The GLC models (W 253) will be offered in North America with V6 engines and in Europe and China mainly with new four-cylinder patrol or diesel engines. As right-hand-drive-markets are very important to Mercedes, we may expect that the GLC Coupe will eventually also become available there. The Coupe will be built in the Mercedes plant in Bremen, the GLC in Bremen and in China. Recently Daimler announced to plan to invest one billion euro in the plant that works under its joint venture with BAIC. This entry was posted on Wednesday, April 22nd, 2015 at and is filed under Automobiles. You can follow any responses to this entry through the RSS 2.0 feed. Both comments and pings are currently closed. Wait until people start trying to climb in and out of the back seats and sales will plummet. Some of the car designers have forgotten form follows function. The CLA is a perfect example of body styling gone very wrong.